Steven Captain Americas his shield. And three in one day! Though he looked tired, so he does have a limit. Reddit SU page is pointing out that the Gems seem to not be using all their tricks for some reason; can't Garnet make giant grabby hands? Can't Pearl throw a blast of light? Can't Amethyst turn herself into a helicopter at least as fast at Peridot's hand-a-copter? I am wondering about that myself. Fun: "DIE DIE DIE DIE DIE!" Worrying: "This planet has an expiration date!" I was really hoping they'd actually get Peridot this time. It does seem like they didn't use their whole toolbox, but I can easily chalk that up to the team being in a bit of a shambles from the fallout of Pearl's deception. I think what it is is that they had a limited amount of show and needed her to get away. It's good that Garnet and Pearl are speaking again. But this episode was hard to watch, with how desperate Pearl was for Garnet's approval. I hope this becomes the beginning of Pearl having more of a sense of self worth. haha yes "touchstumps". Peridot is my favorite villain. Also I wondered if saying "Good morning!" to her was Steven doing an Uncle Grandpa callout. I saw some people on 4chan speculating that Peridot's foot is cybernetic and not actually part of her body, so now I'm thinking maybe she's just a head piloting a robot suit. This episode also hints (again) that Pearl is just one of many Pearls back on homeworld, and that they're basically a servant class. The ship was part of an invading fleet that Amethyst says was defeated by Earth. Interesting that all of the crystals on the ship were pink. So Rose was an invader. Who shot down her ship over 5000 years ago? I think Amethyst meant, by saying Earth won this one, how overgrown the ship was. There was also another four-crystal diamond authority symbol on that ship. More signs pointing to Rose being dispatched to assimilate Earth and deciding to protect it instead. The show runners have said eventually we will find out how everyone met everyone else so I'm really hoping we'll see Rose make that decision. Also, Pearl's Peridot-tracker clearly indicated the downed ship was in South America, which is the first positive confirmation that the warp pad network is truly worldwide. Peridot seems like the gem equivalent to a cyborg. Her foot didn't vanish the way a summoned object would like say, garnet's glasses or Pearl's spear or even the centipeedle children we saw in Gem Glow. It's as real and permanent an object as the escape pod or the hand ship. I bet if peridot ever got poofed you'd get a gem and her mega man-like arms and legs, if not more. If these were destroyed or she was forced to reform without them, she'd be much different in appearance and lose much of her power. I bet if she ever switched sides to join the crystal gems (I hope she doesn't) it would involve her first losing her robotic parts. Very symbolic. Anyway, I really hope she can't easily replace her foot and is now relegated to hopping around impotently. Personally I found it a little annoying that to resolve the Pearl and Garnet problem they literally trapped them in a closet together and then physically smushed them closer and closer until they were forced to work it out. Or... Get crushed, I guess? I mean, if gems get hurt they retreat into their gems but I guess those gems can get crushed and then they would be dead/too fragmented? Anyway it felt too much like a shortcut, like something I would write in a fanfic to skip over the annoying parts and get to what I wanted to write. So I guess ultimately with the amount of time each episode is it makes sense, but I wish they had been able to do a two-parter resolution without the compactor gambit. I really liked when Peridot skittered around on her fingers - excuse me, her touch stumps. Maybe she calls them her styluses. Styli? Folks I'm friends with keep saying she reminds them of Zim and I can see why but she also makes me think of classic JRPG mid boss antagonists who keep managing to escape and fight another day. The animation in this episode felt looser than the previous ones, especially Steven and Amethyst who were most often all squishy and cute and round. It makes me wonder if originally they were intended to be distance models to give more room for impressing the large interior spaces of the ship onto the viewer? Either way I wanted to see a lot more of the ship than we did. It reminded me in architecture of the warp pads and the temple from Cheeseburger Backpack and really lacked figurative aspects. Tripod saucers? Not what I would have guessed for ancient gem style. Steven using his shield in different ways was great and I liked his little melty moment afterward. I guess he's been training. But considering his inability to stop empathising I was pretty surprised he Captain America'd his shield into Peridot's face how he did. I suspect Connie's influence. Speaking of whom, this whole Steven Bomb has had way way way too little Connie. "Touchstumps" was a very Homestuck thing to say. I have decided this is deliberate homage. Also, Pearl's Peridot-tracker clearly indicated the downed ship was in South America, which is the first positive confirmation that the warp pad network is truly worldwide. One previous episode, before warping out, Garnet says she detected a disturbance in the "northern hemisphere," which could also be seen as a hint. And if warps can go off-planet, well, then trans-global isn't a stretch at all. Her foot didn't vanish the way a summoned object would like say, garnet's glasses or Pearl's spear or even the centipeedle children we saw in Gem Glow. Ah, but don't forget that Pearl's holograms don't autopoof. One persisted almost the entire time Pearl herself was poofed. Aah, we disagree there. It'd be great for someone for Pearl to relate to, and the thought of Peridot interacting with Beach City citizens is too wonderful and hilarious to not hope to see. Anyway, I really hope she can't easily replace her foot and is now relegated to hopping around impotently. This, however, would be great. Speaking of whom, this whole Steven Bomb has had way way way too little Connie. Amethyst having a human best friend is so wonderful and unexpected, but makes perfect sense when you think about it. She's the Gem with no ties, memories or socialization involving homeworld. Ah, Onion wanted Ranger Guy back in Onion Trade to help remind him of his oft-away dad, and gave Steven Explorer Gal to help him cope with not having a mother! This episode revealing that Pearls are typically told what to do casts light on Pearl's memories in Rose's Scabbard and Sword To The Sword: Rose asking what was probably her assigned assistant or chattel Pearl to stay with her instead of ordering her to and Pearl's fanatical devoting to Rose, who probably saw her as worthwhile unlike everyone else she'd known. You may like this fan comic, Mr.Encyclopedia. I, too, wish there was more Connie. I suppose we've only recently reached the point where Steven is a regular mission participant, and if Connie tried to tag along I doubt Garnet would be in favor and Pearl would be the one arguing to include her based on her training. Soooo maybe this week is not the best time for that. Sardonyx appearing in this episode was a nice bookend, although I agree resolution-by-deadly-danger device is a bit pat. At least each episode previous has featured the gems working through their feelings for the betrayal. I chalk it up to writing to include everything in 11 minute chunks. I sometimes think longer episodes would be better, but I do like how it keeps things very tight. I mentioned the worldwide network of warp pads because I remember someone assuming the island Steven, Sadie, and Lars went to was physically close to Beach City, which I think isn't a given at all. The crystal gems go to plenty of exotic locales like deserts and ice caves and mountainous temples so I don't know why anyone would make that assumption, now it's spelled out. I guess I could get behind Peridot-as-friendly-nemesis but I still want to see her go through a physical change to get there. Jasper is the one I'm more interested in seeing rehabilitated into an ally, probably because of my secret, hidden desires regarding her and Greg. Mr.Encyclopedia your ideas are gross and I would like to subscribe to your newsletter. Amethyst performed a Sonic the hedgehog style spin charge here, just like Jasper did when she fought Garnet. I think I saw a theory somewhere that they could be gems of the same... pattern, if that's the right term (like the multiple Pearls?). Jasper was then more developed on Homeworld than Amethyst was on Earth (hence her referring to Amethyst as 'an overcooked runt'). Some sort of warrior class/caste maybe? The little back-and-forth with Peridot with the crystal mics was hilarious. %n: ""Touchstumps" was a very Homestuck thing to say. I have decided this is deliberate homage." Your name is PERIDOT and today is your POLISHING DAY. I would read this fic. Sokka shot first: Wish granted. In the middle of all the personal conflict, it's easy to miss that Pearl picked up a new trick! Not only is she getting acquainted with modern gem* technology, but she is able to interface with the screen by touching it then projecting the output as a hologram with her gem. Further evidence that the "magic" of the gems is really advanced technology and that the Gems themselves are like sentient computers. A note on capitalization. I leave "gem" uncapitalized, as it refers to a species, but "Gem," as in Crystal Gem, capitalized because it refers to the name of an organization. All this is described in fuller detail in my upcoming Steven Universe Style Guide, for sale soon on all civilized planets. Note that most of the Gems are named after silicate minerals; we will have to forgive the show for deciding that Ruby + Sapphire = Garnet when this doesn't work out chemically. Notably, Pearl's namesake is simply calcium carbonate, no different chemically than the shell of the clam producing it. I suppose you could make an argument that in silicon society, being made of carbon is itself proof of her inferior status? Of course, to the best of my knowledge, transistors are made of silicon, not calcium carbonate. So really, Rose Quartz using Pearl as a personal computer would be closer to a mirror symmetry of Earth technology, I guess. Since everyone is on the train that Pearl is a defective example of a mass-produced servant caste I really hope whoever or whatever produced her is called mother-of-pearl. Remember how the homeworld ship was the shape of a humanoid hand? When Peridot is taunting the Gems and Steven hands the gem mike to Amethyst to speak through, she begins with: "Hey, uh, this is Amethyst?" like she was an audience member on a talk show. After Sardonyx breaks out of the trap, we move to Peridot who is hilariously frustrated with the ancient tech in the control room. List formatting brought to you by way of Markdown For Metafilter. Pearl and Peridot are skinny forehead-positioned gems with technical expertise. Jasper and Amethyst are bulky fighters with weaponized long hair. Ruby, Sapphire, and Lapis each have an elemental affinity. Rose Quartz and Yellow Diamond are.... both offstage currently? I'm just calling them that now. For everyone. I'm definitely willing to believe gem placement has something to do with abilities/affinities, but I fell like we don't have enough data points yet to know exactly what the system is. Although it's interesting to think that Rose's belly gem might have something to do with her affinity for growing things and organic life. I also feel like drawing conclusions about purpose and job and type of gem from body shape does a small disservice to the generally excellent job the Steven Universe team does in portraying characters (and specifically women) of all body types and how that has very little bearing on their personalities, interests, and abilities. I mean there's a statement there to be drawn from the idea that the Homeworld, being eeeeeeeevil, codifies this, and the Crystal Gems being the good guys are like "Pearl can be whoever she wants to be!" and "Garnet's strength comes not from her size but her love!" but that's honestly a lot less subtle than I've come to expect from this show. Why does Peridot hate Earth? Official video, The Classroom Gems: What Are Gems?, both a good introduction to gem biology and a parody of the Gunbuster science lessons. My theory is that Pearl and Peridot are related/from the same sort of gem. Every so often the fandom makes something kind of amazing. Here is an example: This is Garnet, here's the weather. 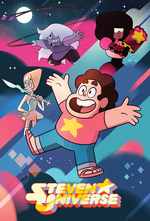 Interview about Steven Universe, with Rebecca Sugar, Ian Jones-Quartey and Estelle. Garnet never asks questions. That's an interesting detail that I hadn't noticed. As soon as I read that, I thought, "is that true? ", and started rummaging through my memory. "Can't you see that my relationship is stable?" was the second line I considered. I guess rhetorical questions aren't what they had in mind. I rewatched "Coach Steven" and now I'm confused about what "Strong in the Real Way" means in the context of this arc. Is Sardonyx strong in the real way? "Friend Ship" revealed that Pearl thinks she's weak; while singing, is she bluffing and trying to convince herself that she's actually strong? What does she think real strength is?? "Friend Ship" revealed that Pearl thinks she's weak; while singing, is she bluffing and trying to convince herself that she's actually strong? The bluff is kinda revealed in the actual song, isn't it? I love Pearl, but has she ever inspired Steven to do anything? From Tumblr, the amazingly silly Texts Between Gems. Tumblr: someone found a comment from a 15-year-old Rebecca Sugar. Right now we have Steven Universe, Bee and Puppycat, and Star vs the Forces of Evil, all of them run by women about the same age. The influence of Sailor Moon on all these shows is quite obvious. Rebecca Sugar, Natasha Allegri, and Daron Nefcy all watched Sailor Moon when it aired on Cartoon Network in the 90s, and it deeply influenced them and inspired them to become animators, and that's AMAZING. Fan comic: Ruby's Impulse Control. Edgy Steven Universe Fan Theory Generator. So, I recently binged all of Steven Universe and this is the final episode I watched. It's an odd coincidence that I was a little disappointed. While this episode accomplished the required Garnet/Pearl reconciliation, Peridot's arc felt disappointingly 2D and repetitive. Haven't we already seen her escape, like, three times by helicopter fingers? Does she have a character beyond slinging grade-school insults at our heroes? The world-building was nice, but I feel like they either should have moved Peridot on a little bit, or not included her at all. I think they are advancing Peridot a bit at a time. She started out a very cold-natured character (remember when she crushed the broken robonoid? ), but she's become steadily more desperate. She also doesn't seem to be comfortable with the idea of violence against other gems/Stevens -- when she fires that exploding energy ball at them, she seems surprised by what it did, and her response to Steven grabbing her leg was (flick flick flick). I think it's further underscoring that Peridot is not a fighter. And in a way that's the point: the Crystal Gems have only managed not to catch her up to this point because they haven't be on their game. The first time they didn't know the extent of Peridot's slipperiness (climbing cliff faces, the hand copter), the second time there was serious inter-Gem discord. The third time they did get her foot. There's an interesting fan comic that suggests that maybe Peridot isn't a gem construct like the others at all. Maybe she's actually like how Lapis was in the mirror, a gem that's powering a device. Then, if they remove the device, the robot body, then she might be able to form a holographic body like the others. Another silly-yet-awesome fan animation: Peridot jamming to Happy Boy, and others find her. Yeah it doesn't fit show continuity but it's fun! The iOS version of Steven Universe game Attack The Light is on sale for $1 right now. It's actually fairly decent! OK, so I'm all out of Steven Universe episodes and metafilter threads about them. I guess it's time to start reading fanfic??? How do I find the good stuff? Also, I can't play the videogame. My made-up religion does not allow me to install the google store or the amazon store on my phone. The game apparently has some ARM code, so I can't run it on an android-x86 VM, and if I copy the .apk to my phone, it complains that it won't run without the Amazon store also installed (I had bought it from the Amazon store using a VM). re: fanfic: have you tried AO3? I have a few fanfic suggests, will report later. Also can't forget there are a good number of funny SU fan comics on Tumblr (which is really the hotbed of Steven Universe fandom). Here's one for you: Pearl Steals A Tater Tot. Easy to lose in all that happened during this episode, but I liked the momentary quiet confirmation that Steven never told Pearl or Amethyst about Garnet splitting up in Keystone--he understood it wasn't his story to tell.